I have damaged front disc. Disc have movement if i move it back and front. In attachment is picture. Anybody knows is it possible to buy only this aluminium part of disc? In our country entire disc brake is insanely expensive, and this brake disc is ok but rivets and this part as I showed in the drawing. Or is it any other alternatve of little bit cheeper disc brake not from HUSA or beringer? Thats a Beringer rotor? You can buy the alu carrier and bobbins separately. Should only cost around 120-150€ for all. Look up on eBay or call local Beringer retailer. Got mine from http://www.ags.ee/ / Estonia. thanks yes this is beringer rotor. Carrier is the word yes. 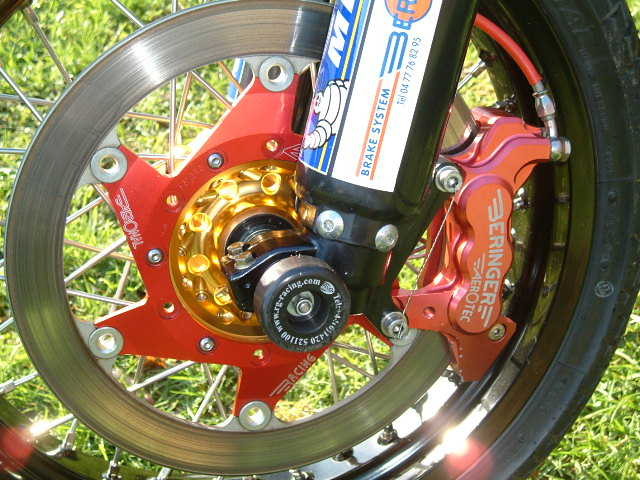 What about some KTM complete rotors are thay any 310mm? On ebay I didn't find anything only cheep chinese rotors at 130eur but 320mm. Called local husaberg parts supplier in our country is only one supplier. Says carrier is not available to buy separately. Only entire disc. Husa disc 800.09.... is not available anymore but new disc is 586.09.060.000 which costs 250 eur. I was thinking if is possible to buy floating disc below 170 eur? I have also that Braking 310mm wave rotor, but switched over to the Beringer cast iron 310mm rotor. Beringer is about ~200g heavier, but it dissipates heat alot better and the brakes feel better imo. Contact the guys at AGS racing, they are Beringer distributor and can sell every single spare parts for Beringer brakes. Thats where I got my carrier and bobbins, because could not find any on eBay. Thanks, I will contact them and i will post the price. Ok this is also available in our country at 40,5 eur, but do you have carrier? The beringer carrier does get groved by the floating pins movement, i switched to a braking disk as they seem to have far less play and better feel.